Finally! 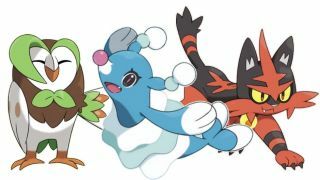 Pokemon fans have been waiting for the evolved forms of Pokemon Sun and Pokemon Moon's starters since the day little Rowlet, Litten, and Popplio were revealed, and today we got 'em. Meet Dartrix, Torracat, and Brionne. What a twist this has been in terms of cuteness ranking! When the starters were revealed, the internet largely called out Rowlet as the most adorable, while Popplio was the lame duck. Now our grassy owl has become either the lead singer of AFI circa 2006, or a soccer mom who needs to speak to a manager. Meanwhile, the goofy seal is blossoming into a beautiful ballerina. Oh, and the cat? It's… well, it's still a cat. Way to maintain that middle of the road, Torracat.